The Carbon Mk IV is the latest version of another long running German Physiks design. 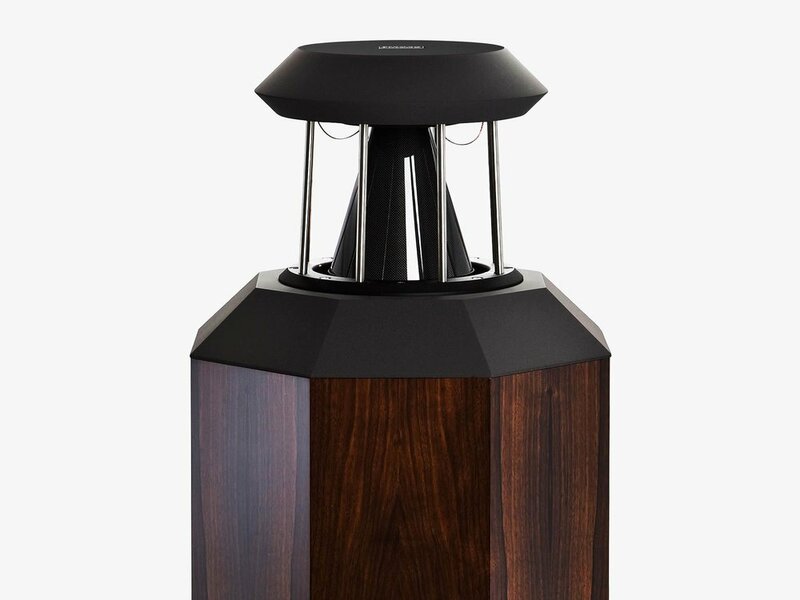 Finished in high polish carbon fibre with a deep, clear lacquer coating, it is a luxury version of the Borderland Mk IV, using the same crossover and cabinet, with a single DDD driver and a downward firing 12-inch woofer. Like the Borderland, the Carbon MK IV produces exceptional dynamics and resolution, together with the German Physiks hallmark musicality and three-dimensional stereo imaging. The Carbon MK IV has always been an exceptional performer. The latest version has a new crossover design that provides significantly better bass, with improved integration with the DDD driver, resulting in exceptional top to bottom coherence. The resolution and dynamics have also been noticeably improved, removing another veil between the listener and the music. All these improvements come together to produce a sound that is truly effortless. 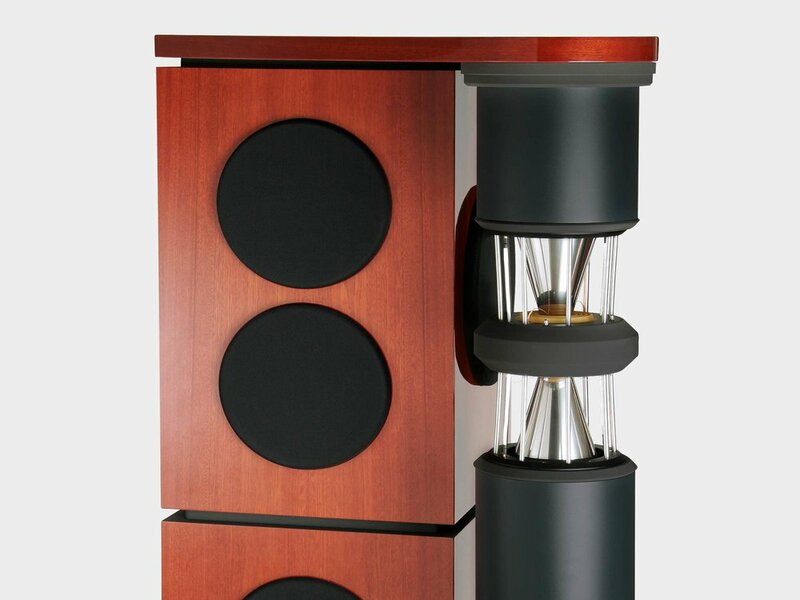 The Carbon Mk IV uses a single 12-inch woofer of the same type used in our prestige Loreley model. This provides a degree of bass extension normally associated with high quality component sub-woofers. 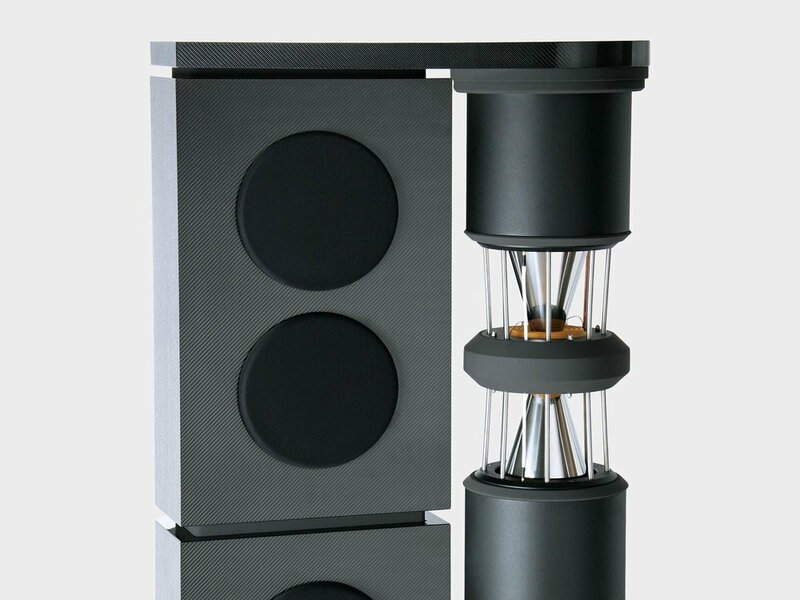 Most impressive is that this is achieved with a cabinet of relatively modest dimensions, making this a loudspeaker that is easy to live with. The bass driver is located at the bottom of the cabinet and works in a “sealed” enclosure. This enclosure is linked via a small opening to a smaller cavity located at the top of the cabinet. This cavity acts as a Helmholtz Resonator and is tuned to the resonant frequency of the main bass enclosure and ensures a smoother bass response. 2. It has an exceptionally wide operating range. 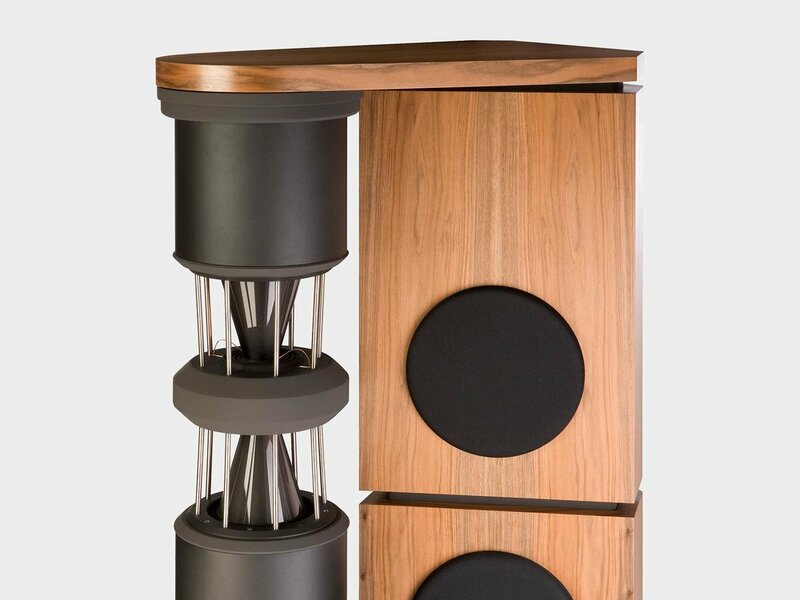 In the Carbon MK IV it covers the range from 190Hz up to 24kHz – almost 7 octaves. 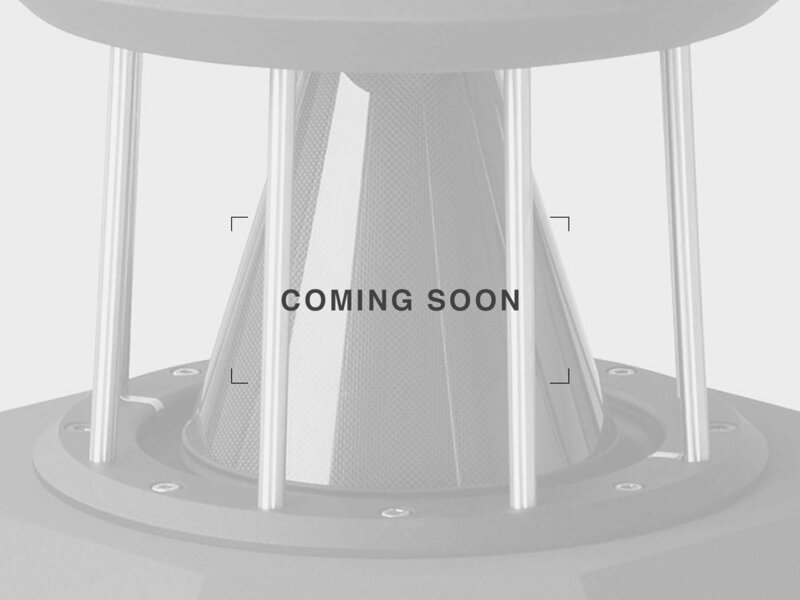 The DDD driver’s omnidirectional radiation characteristic and its very wide operating range, together with several other key features give the following important advantages to all German Physiks designs and is what sets them apart. This is because the DDD driver's omnidirectional radiation characteristic creates an enveloping sound field like that in the hall, rather than beaming the sound at you as conventional drivers do. This way the Carbon MK IV is able to recreate a more natural rendition of the original stereo image. 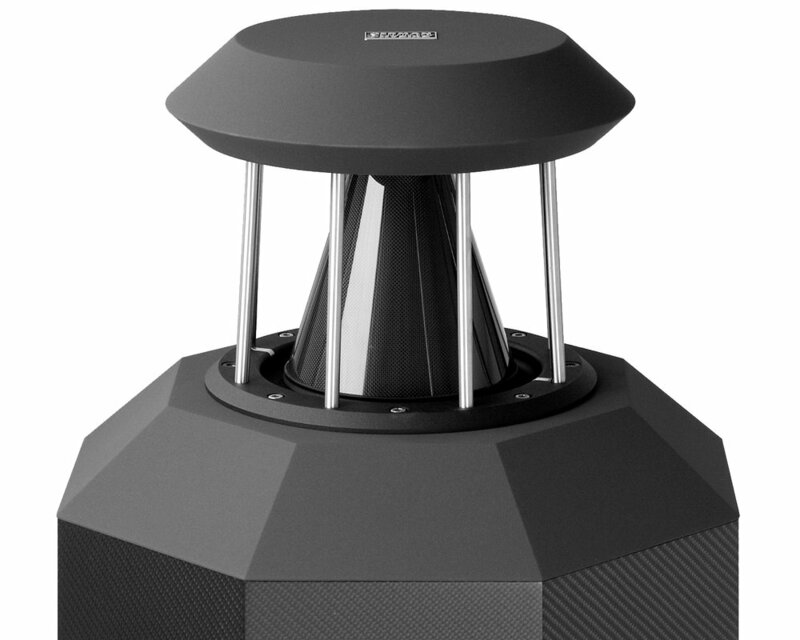 This has excellent depth and focus, but without the overly sharp image definition that some hi-fi loudspeakers produce and which you will rarely if ever hear at a live performance. As you are not restricted to a small “sweet-spot” in order to hear the best sound, the Carbon MK IV provides a more relaxed listening experience. This is especially noticeable when you listen for long periods. This is because the DDD driver is phase linear across its operating range. This together with the excellent dynamic response, enables the Carbon MK IV to reproduce percussion with startling reality. Voices have a clarity and purity that can be breath taking, with all the elements of the vocal sound correctly located in space and with no undue emphasis. The hardness you often hear with conventional tweeters is eliminated and you get a greater sense of hearing a live musician. The DDD driver can withstand abuse that will destroy most other drivers. This is illustrated in the video below. We don’t advise our customers to try this, just in case they are having an unlucky day. 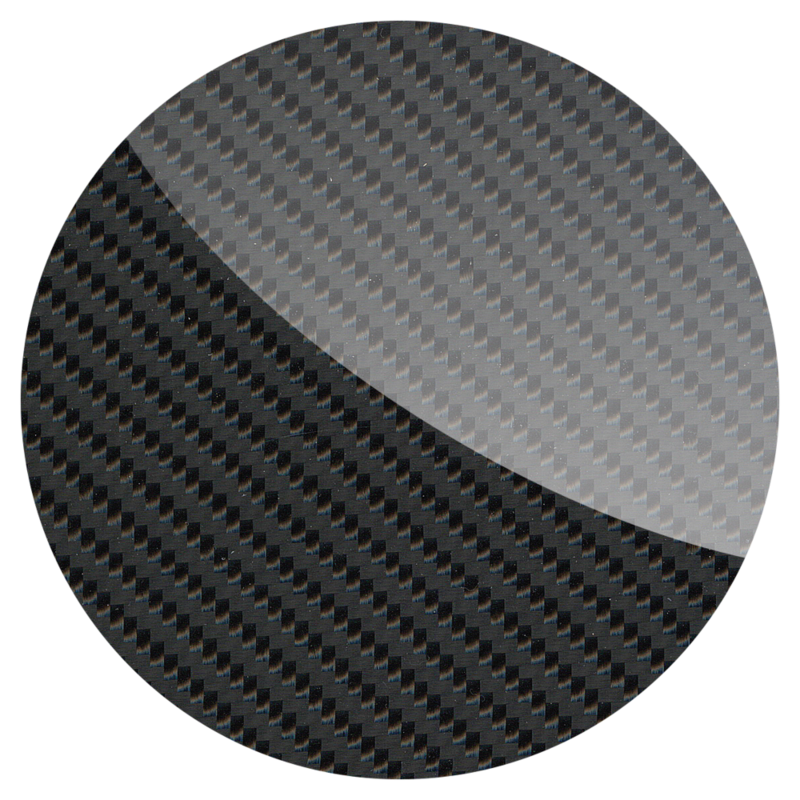 The DDD driver’s omnidirectional radiation pattern and wide operating frequency range make the Carbon MK IV less critical of positioning in the room than conventional loudspeakers, so they are usually very quick and easy to set up. In addition, because the Carbon MK IV is omnidirectional, there is no toe-in adjustment to worry about, which is one less variable to deal with on set-up. The Carbon MK IV will drive rooms up to 90 square metres (950 sq ft) in size, yet the footprint is a modest 404mm x 404mm (15.9” x 15.9”). It can also work well in smaller rooms. We have successfully used them at shows in rooms as small as 285 sq ft (27 square metres), but as with any loudspeaker, we always recommend a home demonstration before you make a final choice. Two sets of high quality WBT nextgen™ loudspeaker terminals are fitted allowing the Carbon MK IV to be bi-wired or bi-amped. High quality jumpers are supplied to enable the loudspeaker to be used with just one set of loudspeaker cables. Jumpers on the rear panel allow the high frequency output level to be adjusted in 4 steps: -2dB, flat, +2dB and +4dB. This allows the user to easily compensate for the variations in the absorption of high frequencies that occur due to different types of furnishings and room constructions. 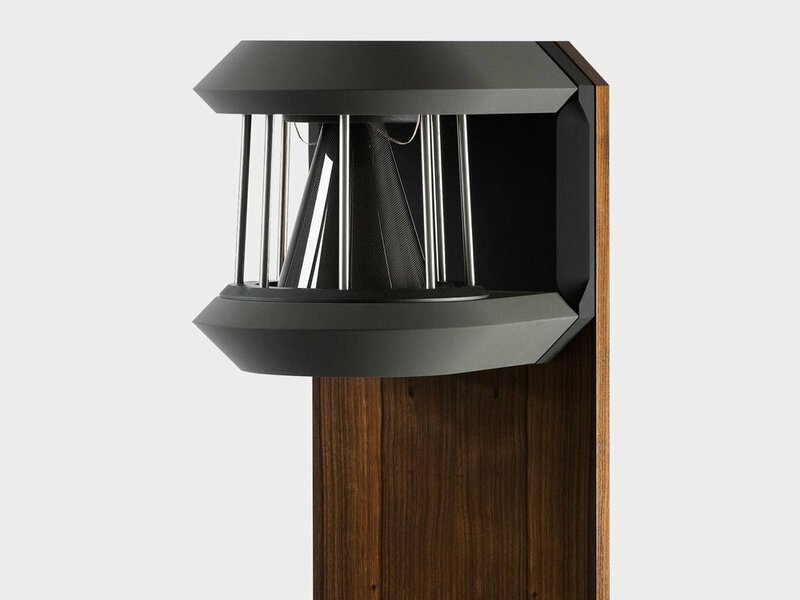 The Carbon MK IV uses an octagonal cross-section cabinet constructed from heavy panels of MDF, with re-enforcements fitted to critical points within the structure. 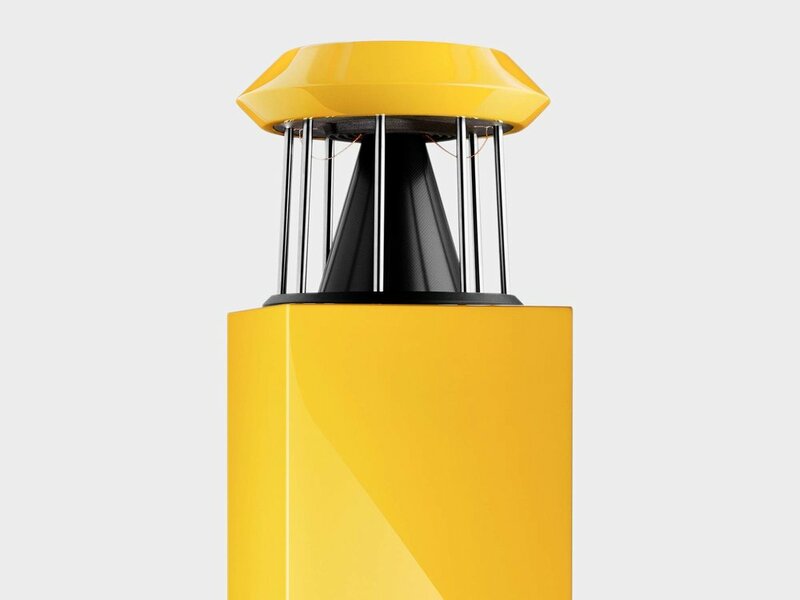 The use of an octagonal cross-section allows the individual panels to be made smaller and therefore stiffer than they would be if a conventional square or rectangular cross-section were used. 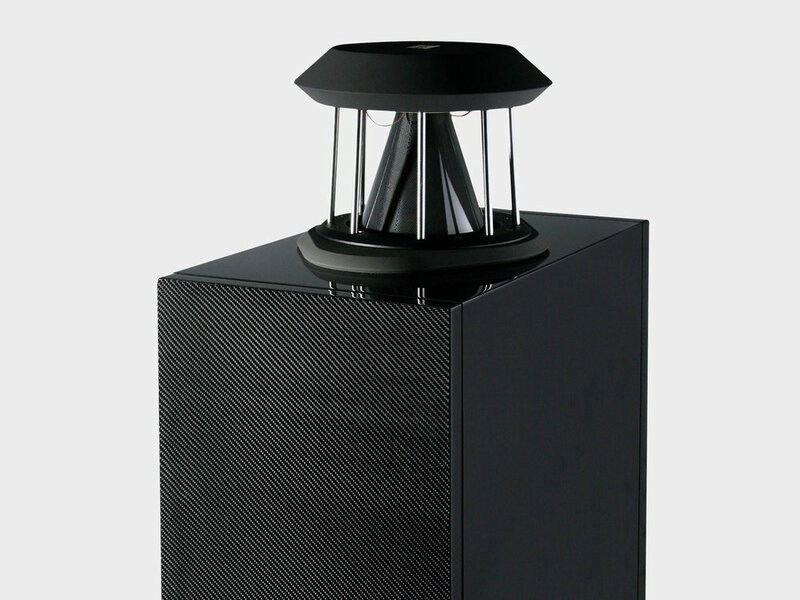 This construction minimises the colouration caused by cabinet resonances, which would otherwise degrade the loudspeaker’s ability to resolve fine detail and so reduce its ability to produce a sense of realism. Residual resonances are minimised by applying a special damping material called Hawaphon® to the inside of each panel. Hawaphon® is a polymer sheet containing a matrix of small cells filled with very fine steel shot and was originally developed as an anti-surveillance measure for use in military and government buildings. It adds mass to the panel to reduce the resonant frequency and the ability of the shot in each cell to move against each other provides a very effective way of converting vibration energy into heat. Hawaphon® achieves a broadband attenuation of structure-borne sound of more than 50dB, which is a remarkably high figure. Finally, to damp resonances of the air within the cabinet, the whole of the inside of the cabinet is lined with a thick layer of high-density felt. As you would expect from a German product, the quality of construction and reliability are first class. We use the same quality of parts in the Carbon MK IV as in our reference products, where we design for a minimum life expectancy of 25 years. For this reason we have selected highly corrosion resistant V4 grade stainless steel for the DDD driver support pillars, terminal mounting plates and all the screws. Meticulous care and attention is paid during the manufacture of the Carbon MK IV. Prior to assembly all components and materials are subject to a rigorous inspection. We also carry out detailed inspections at each stage of the manufacturing process. We can afford to do this as we build our products by hand in small batches. 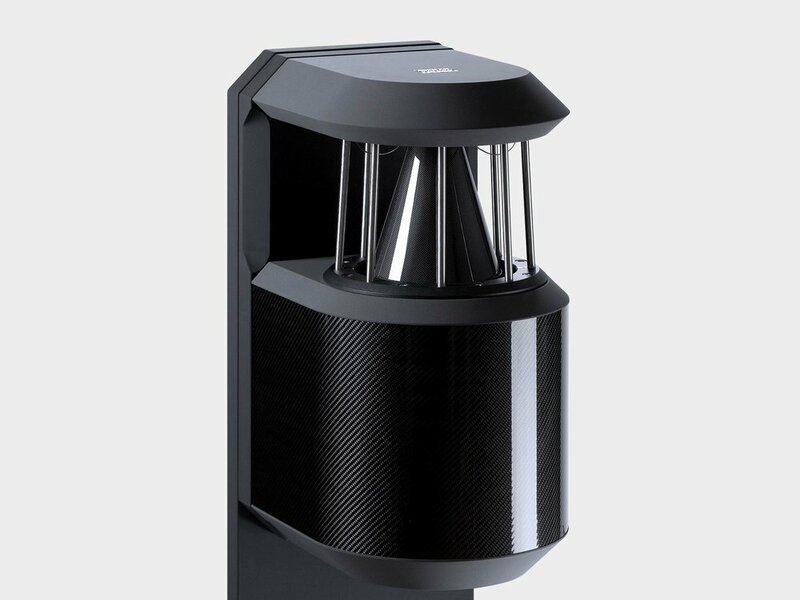 After assembly, the performance of each loudspeaker is measured. Then it is burnt in for at least 12 hours and measured again. Once the burn process is complete each loudspeaker is given a final detailed physical inspection before being packed. 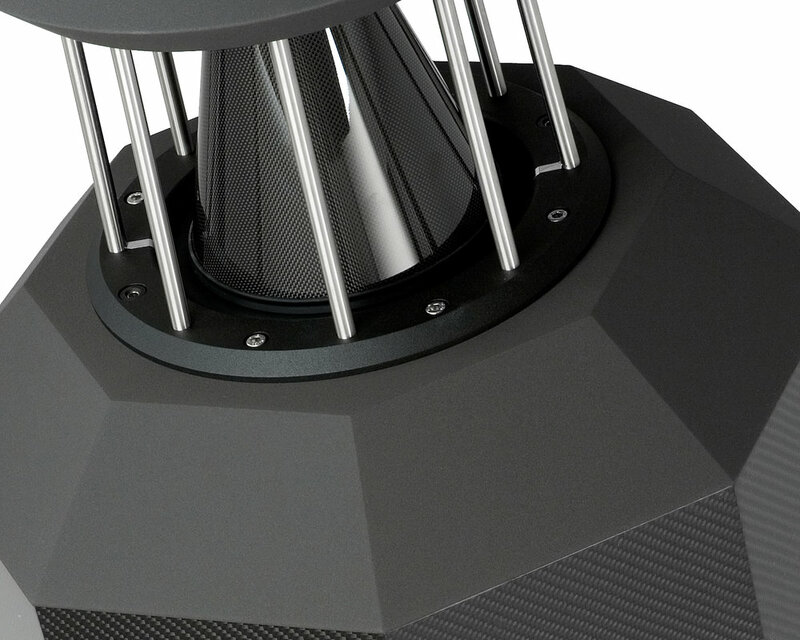 The sides of the Carbon MK IV’s loudspeaker cabinet are covered with several layers of bi-directional, resin impregnated carbon fibre, which are applied using techniques originally developed for the aircraft industry. Several layers of clear lacquer are then applied on top of this. Each layer has to be allow to fully harden before it is hand polished and the next layer applied. This has to be done with great care and is a time consuming process, but the end result is a truly luxurious finish. 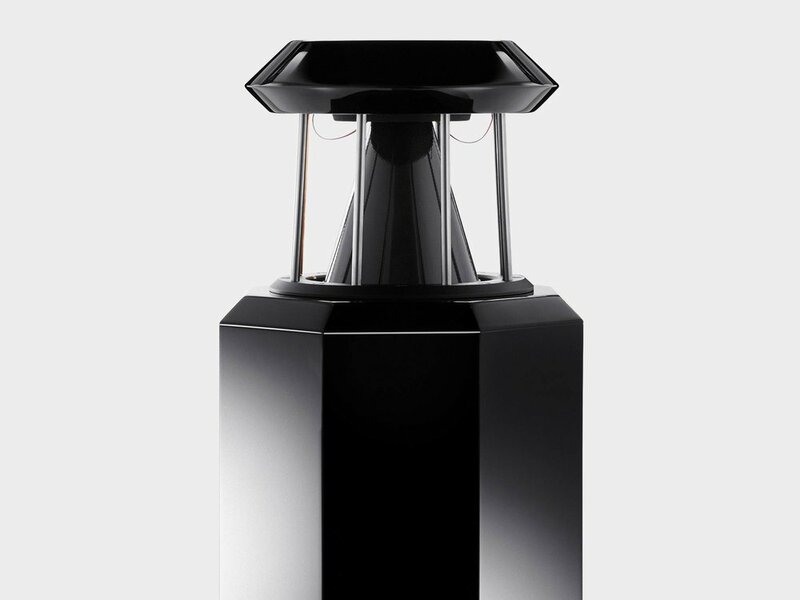 All other parts of the Carbon Mk IV are finished in high polish black polyester.